A map created to guide visitors around a Hertfordshire town has been mocked on Facebook for its phallic shape. 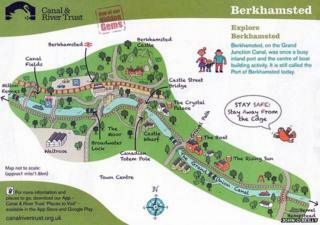 The Canal and River Trust map of Berkhamsted features the town's castle, train station and Grand Union Canal. But while one of the breweries along the canal praised the map as a "great graphic", its shape was compared with male genitalia on social media. The Canal and River Trust said it might have been "a bit naive" in not noticing its shape prior to publication. One Facebook user said: "It looks like a willy tee hee!!" "You've got to see this," said a Twitter user. The map of Berkhamsted - where the English surrendered to William, Duke of Normandy, in 1066 - is one of scores created for the Canal and River Trust in the past year to promote the nation's waterways. Simon Salem, of the Canal and River Trust, said the trust had not noticed the shape of the map until it was pointed out. "This is one of about 100 maps we've been promoting. It does look, as the poster on Facebook says, like a willy. We didn't notice it. Somebody should have seen it, I agree. "You could accuse of us of being a bit naive but canals are long, straight things, and when you draw a map it tends to be that sort of shape." He added: "If it gets at least one more person down to the canal then it has worked." Berkhamsted's mayor Peter Matthews said although the town council had no control over the trust's publications, it welcomed any effort to bolster tourism.